Fall colours are here, and so is the snow! Snow has fallen on most of the GDT and early season avalanche conditions exist where snow has accumulated. Expect wet, icy and slippery trail conditions, and wet and muddy sections at lower elevations with recent rainfall or snow melt. Heavy boots or cleats and poles are recommended. Nighttime and early morning temperatures are below freezing, so be prepared for cold temperatures and shorter days when travelling into the backcountry this fall. ELK RUTTING SEASON WARNING: It is elk rutting season until mid-October. Warning signs that read “ATTENTION – Elk Mating” have been posted at areas where elk herds often gather. Be aware that bull elk become extremely aggressive during rutting season so keep at least 30 metres away from all elk and never get between a male and female elk. BEARS: It’s pre-hibernation feeding season for both black and grizzly bears which increases the chances of running into a bear on the trail. It is easy to surprise a bear that is focussed on feeding so make noise while hiking in bear territory. Be alert, make noise, carry bear spray and if you see a bear, back away slowly and leave the area. 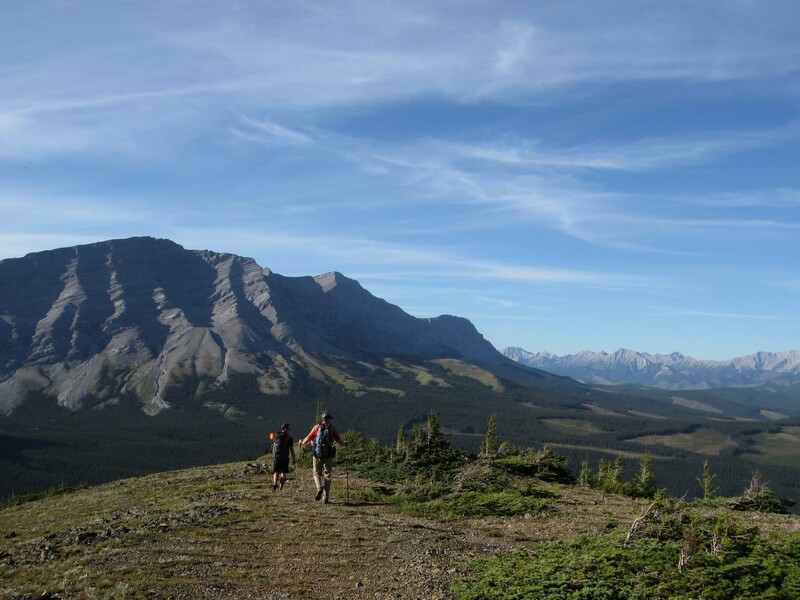 Due to last year’s Kenow wildfire and this year’s Boundary wildfire, some trails and backcountry campgrounds in Waterton Lakes National Park and Akamina Kishinena Provincial Park are closed. The GDT is closed from the Carthew-Alderson trailhead (a3) to Sage Pass (a17). Trail 7 near Jasper is closed to hikers south of the junction with Trail 7e and north of the junction with Trail 7a due to grizzly and black bears frequenting the area. Detour by taking Trail 7e to Mildred Lake from where you can take several different trails (4a, 7b) to reach Old Fort Point trailhead. Equestrians can still use Trail 7 but are not to dismount. The Elysium Pass, Virl, Dorothy and Christine Lakes trailhead is closed during construction of the Meadow Creek Bridge, expected to continue until November 2018. During this time, the Marjorie-Dorothy Lakes Alternate Route and Elysium Pass Alternate Route will not be accessible from this trailhead. A large avalanche has destroyed about 200m of trail near Tornado Pass (b16). A detour route has been flagged starting at 49.920405N, 114.667765W and intersecting with the GDT again at 49.957641N, 114.658199W, just below Tornado Saddle. The David Thompson Heritage Trail was cleared from Cairnes Creek to Lambe Creek in September 2018. The damaged Lambe Creek bridge (d10) washed away in 2015. A small piece of the old bridge and a temporary log bridge allow hikers to cross. If the temporary bridge washes away, it is recommended to ford downstream where the creek is wider and shallower, and cross early in the morning when glacial melt is lowest. The Howse Pass Trail from Conway Creek (d12) to the Glacier Lake trail junction (d14) is in very poor condition. The trail is overgrown, with hundreds of wind-fallen trees across the trail. Hiking in the Howse River floodplain is highly recommended when the river is low enough to safely ford. Parks Canada has advised that GDT hikers are able to hike through the Mistaya Canyon/Howse Pass trailhead during the parking lot closure as long as the closed area is avoided. The Walker Creek Forestry Road is driveable to the Kakwa trailhead but a high clearance 4WD vehicle is recommended. A washout at km 66 may be impassable to non 4WD vehicles. For more information on road conditions, check out Alberta 511 and Drive BC.